Retreat to Love - Now in Audio! So you can imagine how excited I was to get the notification that RETREAT TO LOVE's audio production - read by the stellar Amy Rubinate - is now available! Would you like a FREE COPY? Of course you would! Sign up for my NEWSLETTER below and you'll be automatically entered in a drawing for it. As usual, Amy did a beautiful job bringing my story to life, and I know you'll enjoy hearing her narrate Ashlyn's journey to the FireWind artists' retreat, and her emotional journey as she confronts a family secret, and finds an unexpected love. Check out the sample, then head to Audible or iTunes to put RETREAT TO LOVE in your ears! One of my favorite parts of writing is generating backstory. This rich history of what happens before Page One adds depth and richness to the characters, even if it doesn't make it into the finished book. In creating the world of RETREAT TO LOVE, I wrote a story about how Ashlyn's Gran and Pappa met. It didn't fit into the novel, but their relationship has a massive impact on how Ashlyn views the world. I'm excited to share their earliest days with you here. Enjoy IRISH CHAIN, and check back here soon for an update on the RETREAT TO LOVE audiobook! As my RETREAT TO LOVE Pinterest board makes abundantly clear (as does the book itself, I suspect! ), I think quilting is fabulous. But I'm not especially talented. Kind of a good thing, really, because quilting takes a ton of time, and if I was better I'd want to spend alllllllllllllll my time hunched over my sewing machine instead of hunched over a keyboard. Regardless, I try periodically to put together a quilt that does me credit, and no matter how approximate my corners, I love the process. I've written about some of the work I've done on my general books / life blog, and wanted to link to it here so y'all could check out my creations. But remember, Ashlyn in RETREAT TO LOVE is a far, far more talented artist than I could ever hope to be. The fabrics in this first quilt I ever made, back when I was in college, are tied to my childhood. 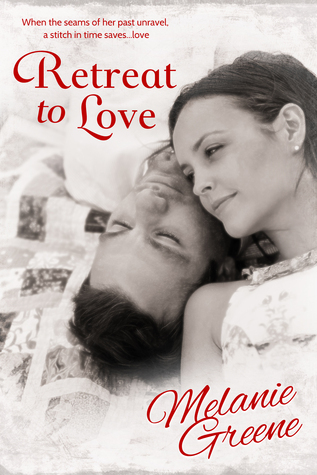 Follow Melanie's board Retreat to Love on Pinterest. It's fun to compile Pinterest boards for each of my books, but I had to exercise some SERIOUS self-restraint when picking photos for the RETREAT TO LOVE board. I'm so madly in love with quilt art, and would fill the entire board with it, but I am trying to highlight a couple of other things about the book, as well. Also I want to ensure accreditation - everything I've pinned was linked through the International Quilt Association, which brings the Quilt Show to Houston (where I live) every fall, and it's the best time of the year. The work on display there is simply stunning.